The Joker means to make an impact on the lives of the Gordons. When the Joker makes this brief, honest observation of his arch-nemesis, he succinctly encapsulates the similarity of their motivations. However, the two men have approached their respective bad days differently. Very differently. Batman was driven to end crime in Gotham City while the Joker enthusiastically embraced chaos through random acts of violence, crime, and murder. And it is all due, we are led to believe in some capacity, to one bad day. Alan Moore explores the Joker’s origin just enough to give us a peek into what inspired his life of crime. Yes, he and Batman both had bad days, but there is a significant difference. When Batman’s parents were murdered by a street thug, though the crime was indiscriminate, Bruce was given something tangible to strike out against. However, the sad sack who eventually becomes the Joker is more a victim of happenstance. He can’t seem to get a break in life. When tragedy strikes him, it is unexpected and illustrative of the unfair events that can befall us. While Moore offers the similarities of Batman and the Joker, it is clear by the story’s end why they remain on opposite sides. “The Killing Joke” is a simple story, most infamous for the Joker’s shooting of Barbara Gordon which results in the former Batgirl becoming a paraplegic. In truth, this is a brief but telling study of Batman’s greatest villain and his twisted and, more importantly, flawed mission against all things good. Artist Brian Bolland, whose works primarily these days on comic book covers, delivered some of the best work of his career with “The Killing Joke”. From it iconic cover to its chilling photo-realistic interiors, Bolland fills his pages with haunting imagery. The artist’s work is beautifully detailed, but it’s his meticulous handling of his characters’ expressions that make his artwork so memorable. Batman wants to put an end to his war with the Clown Prince of Crime. The story opens with Batman going to Arkham Asylum for a man-to-man discussion with his enemy. “I’ve been thinking a lot about you and me,” says Batman. “About what’s going to happen to us, in the end. We’re going to kill each other, aren’t we?” This scene and the final one, in which Batman attempts to extend an olive branch to the Joker are so integral to the Batman mythos. They must exist. 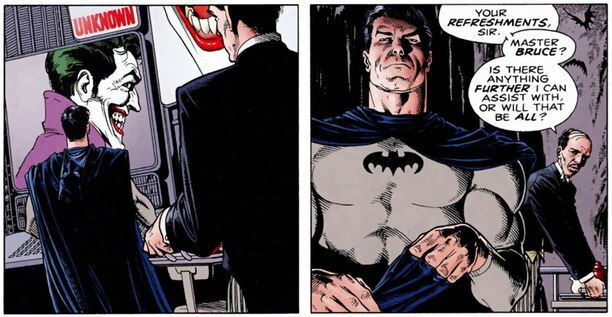 These scenes serve to convey that, regardless of all the mayhem, death, and willful destruction, Batman believes redemption is possible for the likes of the Clown Prince of Crime and any other number of rogues. Joker is soon out of Arkham Asylum and plotting an excruciating experiment to prove that even the most upright man can be driven to insanity. His victim is Commissioner Gordon and the Joker is willing to use Gordon’s daughter Barbara to prove his point. The villain humiliates Gotham’s top cop and psychologically batters the man in a scene of unimaginable cruelty. Sure, the Joker beating Jason Todd to death with a crowbar was awful, but the zeal with which he tries to run Gordon’s mind into the ground is especially appalling. In-between the scenes from the present day story are a series of flashbacks that build up to the Joker’s very bad day. Moore and Bolland take on the difficult responsibility of bringing to life a backstory for a character whose lack of backstory adds to his menace. But Moore knows his craft and keeps from revealing too much while still exploring the unnamed man’s life. He’s a would-be comedian who can’t earn a steady paycheck and he’s married to a woman with a baby on the way. When there is no way to make ends meet, the man decides to commit a crime to give his wife the life she deserves. For Batman fans who prefer the Joker’s origin steeped in mystery, Moore includes a brief bit of dialogue from the Joker to indicate that he is an unreliable narrator “Sometimes I remember it one way, sometimes another.” In my mind there are elements of truth to the story, but ultimately we may have only been given an idea of the Joker’s true beginnings. With Batman enraged, the two battle one another in the story’s final act. After a fairly violent tussle, Batman finally implores the Joker to allow the hero to help him. This is the most powerful scene in the book. Both men are at a draw and Batman knows they are headed down a path in which there is no good way for this to end. The Joker stares at him quietly, as if to size up Batman’s sincerity. He declines. The Joker tells a joke about two men in an insane asylum to explain precisely why he wouldn’t take Batman up on his offer. The Joker laughs, Batman joins in, and the police arrive as we come to one of the most confounding endings in the history of comics. In 2008 Bolland recolored “The Killing Joke” and the result is strikingly different than the work of the original book’s colorist, John Higgins. Higgins’ own palette features the dramatically bright pop colors that readers will recognize from his work on Watchmen. Bolland’s approach to “The Killing Joke” is significantly toned down; he opts for more muted and realistic tones. Bolland has also made slight updates to the art, such as removing Batman’s crest and slightly de-aging Barbara Gordon as she opens the door for an unexpected guest. If you own a printing of the original book, a side-by-side comparison is in order to see how radically Bolland’s work differs from Higgins’s own. There was irony in some of Higgins’s work that is missed in Bolland’s coloring, but in the end it is Bolland’s thoughtful style that fits the story’s chilling tone. In the flashback scenes Bolland employs varying neutral shades, sparingly using red throughout. The red grows ever more prominent until we get our first glimpse of the infamous mask of the Red Hood, the Joker’s former alter ego. Bolland’s rendition of the Joker also benefits greatly from the recolored pages. The villain’s eyes are more menacing and there is greater depth to the color of his costume. 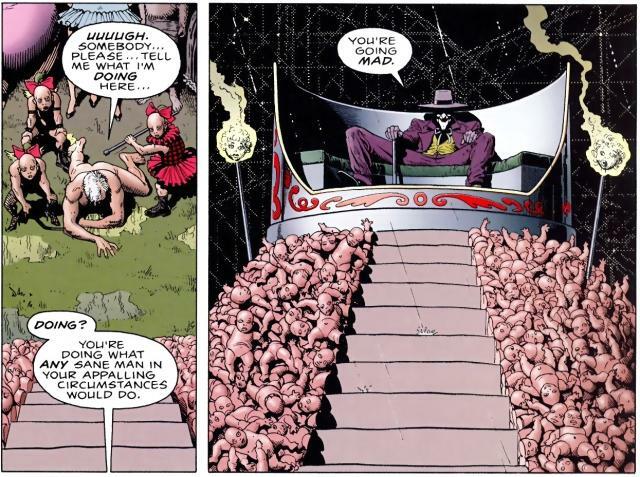 “The Killing Joke” is a definitive look at comicdom’s most popular villain. Where so many writers before and since have chronicled great Joker stories, Moore has masterfully taken us into the head of the villain to show what makes him tick. While we’re there we also get a glimpse of how lost he truly is.